This summer is our first foray into planting an herb garden for the Inn. So in a sunny spot on our back porch, we planted the herbs we use in almost every breakfast we cook; basil, thyme, mint, and flat leaf parsley. We now have an abundant surplus and are incorporating them into most everything, including our cocktails! We thought it would be fun to share some of the delicious drinks we have been sipping so far this summer using our very own home grown herbs! 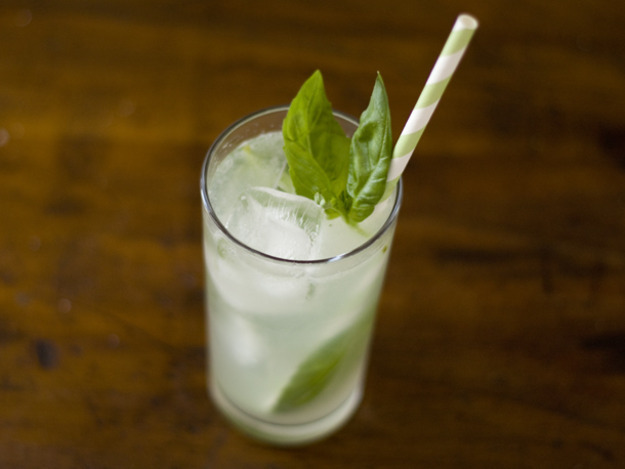 Start by preparing a basil simple syrup using one cup water, one cup sugar, and six basil leaves. Combine the water, sugar, and basil leaves in a small saucepan. Heat the ingredients over high heat until boiling, stirring to dissolve sugar. Reduce to a simmer and continue to cook for 10 minutes. Remove from heat and let cool. Strain through a fine mesh strainer. Basil syrup will keep for one week in a sealed container in the refrigerator. Shake vigorously for 10 seconds. Fill a Collins glass with ice and strain the cocktail into the glass. Add extra basil leaves to the glass, top with seltzer and stir gently. Garnish with straw and basil sprig. Start by preparing the Strawberry Rhubarb Puree. In a medium saucepan, combine all ingredients except the basil over medium high heat. Bring to a boil, then reduce heat and simmer until fruit is tender, about 5 minutes. Remove from heat, add large basil leaves, and let cool completely, about 20 minutes. When the puree cools, discard basil leaves. In a blender puree for about two minutes until mixture is smooth. 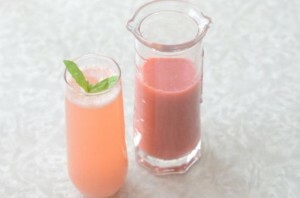 Place 2 tablespoons puree into each glass and fill with sparkling wine. Garnish each glass with small basil leaves. 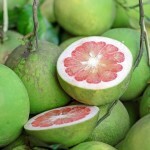 If you have not yet met the pomelo, now is the time! This citrus maxima fruit is a cousin of the grapefruit and is similar in taste with all of its tangy sweetness. It makes a perfect pairing with the herbal flavoring of gin. For this cocktail, we are using some of the basil infused simply syrup that we prepared for our Basil Lime Cooler. (see recipe above). To make the cocktail, fill a cocktail shaker with ice. Add pomelo juice, basil simple syrup, and gin. Shake vigorously for about 10 seconds. Strain into a chilled cocktail glass and garnish with pomelo slice. We hope you enjoy these beautiful, fresh basil cocktails! Stay tuned for more recipes as we walk through our herb garden and share our next seasonal favorites! 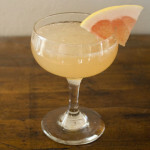 This entry was posted in cocktails, Recipes, Summer Events and tagged cocktails, herbs, summer by admin. Bookmark the permalink.